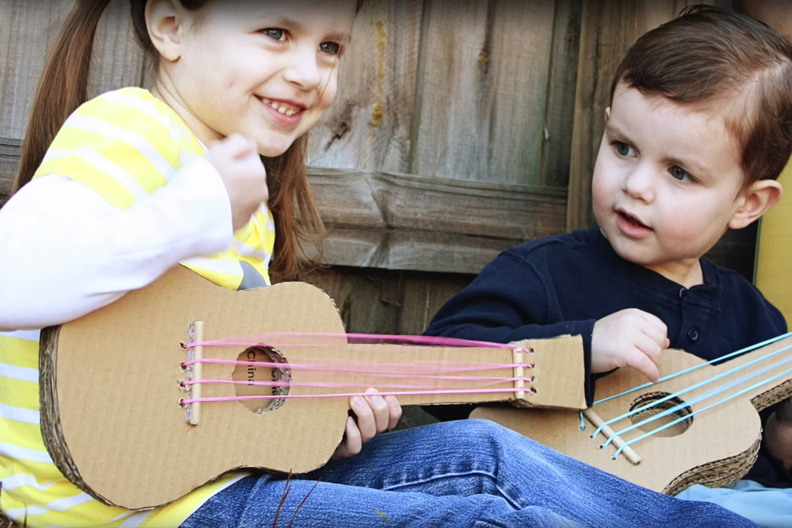 Take the rubber band guitar beyond the everyday shoebox. Playing music is a common way to deal with the winter blues, and a rubber band guitar is a classic rubber-based household project. Just take a shoebox and stretch a few bands tightly around to get that characteristic twang. But it turns out that a rubber band guitar can take on even more of a shape, and maybe even different sounds. On the Youtube channel Make It and Love It, we get a short walkthrough of how to build a full rubber band guitar, including a tutorial. One of the things that sets this design apart is giving the shoebox the boot, using instead several heavy-duty cardboard pieces cut in the shape of an actual guitar. With those pieces stacked and glued together, the body of the guitar has the strength to hold the rubber bands, and even a sound hole like the everyday acoustic. This design uses short sections of pencil for the bridge and the nut, but any dowel should suffice, as long as it supports the rubber bands above the neck and keeps them in place. The project uses a small drill to make holes for the rubber bands to go through, and I don't see why different lengths of rubber band couldn't be used to actually get variations in twangs (though it's not shown here). One of the more ingenious ideas is tying the rubber band ends to paper clips that are anchored to the back of the guitar, which allows for a clean approach, and moderately easy repair when a "string" inevitably snaps during an encore. Kyle Brown is a reporter for Rubber & Plastics News who watched a lot of Mr. Wizard and Bill Nye while growing up. Follow him on Twitter at @kbrownRPN.